Many countries around the world have Federal or State legislation enacted to deal with the formal appointment of a decision-maker for persons who are not capable of making reasonable decisions in their own best interests due to an accident, illness or disability. The nature of the legislation varies significantly between the different jurisdictions. Some are Court-based, some require Tribunals or Boards to hear cases, and there may be different levels of formality and requirements regarding evidence. In Western Australia in 1992 the Guardianship and Administration Act ("the Act") was gazetted which established the Guardianship and Administration Board (GAB or "the Board") and the Public Guardian's Office (now called the Office of the Public Advocate (OPA)), and provided a legal basis for people to execute Enduring Powers of Attorney (EPAs). Until that time, it was possible only to execute an ordinary Power of Attorney if a person wished to appoint someone to assist them in financial matters. If a person lost legal capacity to understand and execute legal documents or make reasonable decisions in their own best interests, then not only did any ordinary Powers of Attorney they had executed previously become ineffective and invalid, but the only remedy for someone else to be appointed as a substitute decision-maker lay with an application to the Supreme Court of Western Australia ("the Court"), which was both expensive and time-consuming. The W.A. Act changed that situation and has been very successful in allowing folk to plan for their future by way of EPAs, and in removing the need for legal action in the Supreme Court to assist incapable people. The Act was based in part on guardianship legislation from other states in Australia (particularly Victoria), as well as Canadian legislation from Alberta (upon which, in turn, much of the Victorian legislation was based). The Board was established, amongst other things, to consider applications made to it for Guardianship and Administration Orders and to make those orders, to review such orders, and to declare the legal capacity of persons with regard to the operation of EPAs. OPA was established, amongst other things, to advocate on behalf of a person about whom an application is made to the Board, to investigate any matter referred to it by the Board or the Court, to assist and advise folk in Guardianship and Administration matters, to promote public awareness of the Act and its provisions, and to act as Guardian of last resort if there is no other person willing or able to act. The Board conducts hearings in a room with a large table, not in a Courtroom. The Board sits along one side, and will consist of one or three members, in proportion to the complexity of the case. The person about whom the application has been made is encouraged to attend, where possible, and sits on the other side of the table, as well as anyone else with "a proper interest" in the case. Witnesses may be legally represented, but there is no necessity for this. A representative from the Office of the Public Advocate (OPA) will often attend, if the complexity or circumstances of the case require it, to advocate on behalf of the person, and/or to provide the Board with the results of any investigations that OPA may have carried out in preparing the matter for hearing, and to present OPA's recommendations to the Board. The Board is, of course, required to decide the matter on the basis of evidence made known to the Board, and is not required to follow what OPA recommends (though often OPA gets it right!). Under special circumstances, the Board will conduct hearings away from the Board premises, in hospitals, hostels and nursing homes, or in country towns. The proceedings tend to be much less formal than a Court, although the Board is a Tribunal of the Supreme Court of Western Australia. 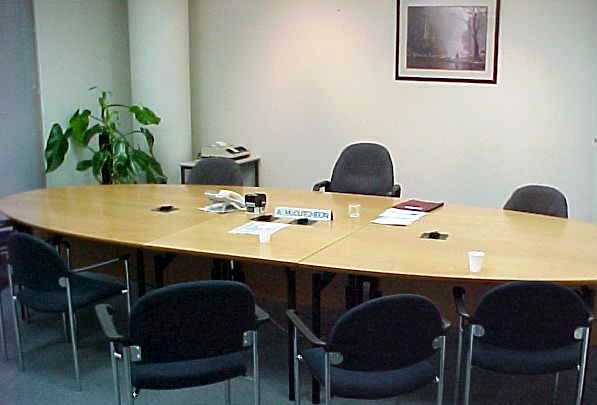 In general, everyone present is given an opportunity to state their views on the matter in question, and when all have spoken, and been given a chance to respond to others' comments, the Board retires from the room for a brief period - 15 to 30 minutes usually - before returning to deliver its verdict. Some complicated matters may take longer to decide and the hearings may be adjourned to another day, or the Board may reserve its decision for later publication. If an Administration or Guardianship Order is made, the Board will specify the date when it is next to be reviewed, always within 5 years, although under appropriate circumstances any person with a proper interest can apply for leave to have a review take place earlier than the date set by the Board initially. Formal written reasons for any decision of the Board can be requested, and decisions can be appealed provided leave to do so is granted by the Board. Appeals go from a single member Board to a three-member Board; from a three-member Board (where the President of the Board is not a member) to a single Judge of the Supreme Court; and from a Full Board (where the President is the presiding member of the three) to a Full Court of the Supreme Court. The President of the Board is a lawyer attached to the Supreme Court at Registrar level (previously Judge level), and the other members of the Board come from many professions and situations. Most have professional or personal experience or expertise with one or more facets of disability, and all are appointed on the recommendation of the State Attorney General for periods of between one and three years. There is presently no limit on the number of times a member can be re-appointed. The web page of the Ministry of Justice has more details of the Board and its relationship with OPA and the Supreme Court.